Always held on the Sunday of Columbus Day weekend. The Dummerston Congregational Church at the intersection of East West Road and Middle Road. The pie selling starts at 10:30 am and goes until they’re sold out. Make sure to get there early and not be disappointed! Autumn in Vermont is summed up by the Dummerston Apple Pie Festival. The town square, anchored by the Congregational Church, is surrounded by several white colonial style houses with large front porches. Trees with various shades of fall color are all around. Traffic is thick on this holiday weekend in October and there is an inordinate amount of motorcycles. The smell of apples in many forms; fresh, baked in pies, hot cider, pervades the air. The sharp scent of the air itself belies the fact that winter is on the way. The fallen leaves crunch underfoot. 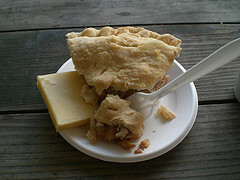 Discussion revolves around how many slices of pie to get, with ice cream or cheese, hot cider or coffee? Then the moans of delight as the first bite of pie is eaten. Lightly browned crust with layers of apple slices, both sweet and tart, and tasting faintly of cinnamon. A scoop of homemade vanilla ice cream plopped on top. Vanilla bean specks are evident and the ice cream is a bit more crystallized, yet at the same time creamier, than it’s grocery store counterpart. Perfection on this fall day.